Home Tags Posts tagged with "Eduard Shevardnadze"
I’m pretty sure I encountered the Gurian khachapuri several times on restaurant menus in Georgia and Russia, only to be told that they didn’t have it “today”, “today” probably meaning any day since the restaurant opening. I finally found one place that made an effort to serve what they advertised, in Astana, of all places. 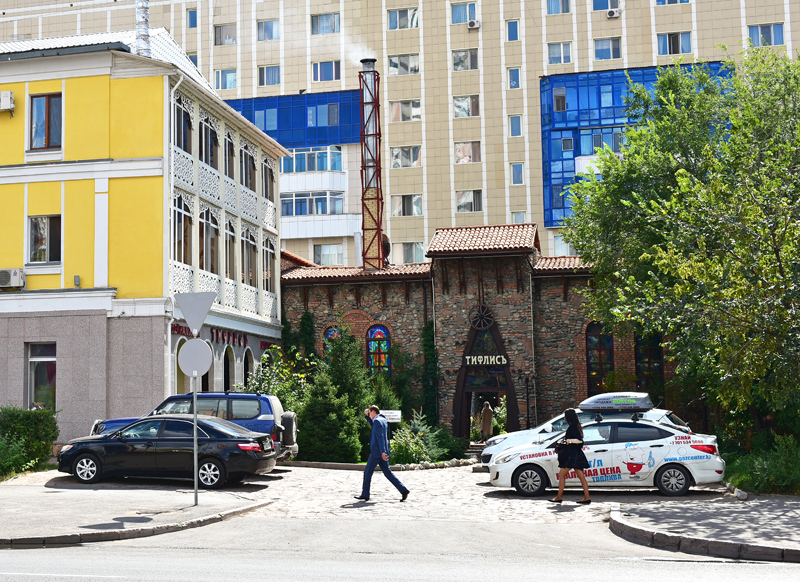 Tiflis, a Georgian restaurant with a Ukrainian manager in Kazakhstan’s capital, even serves a dozen different kinds of khachapuri. 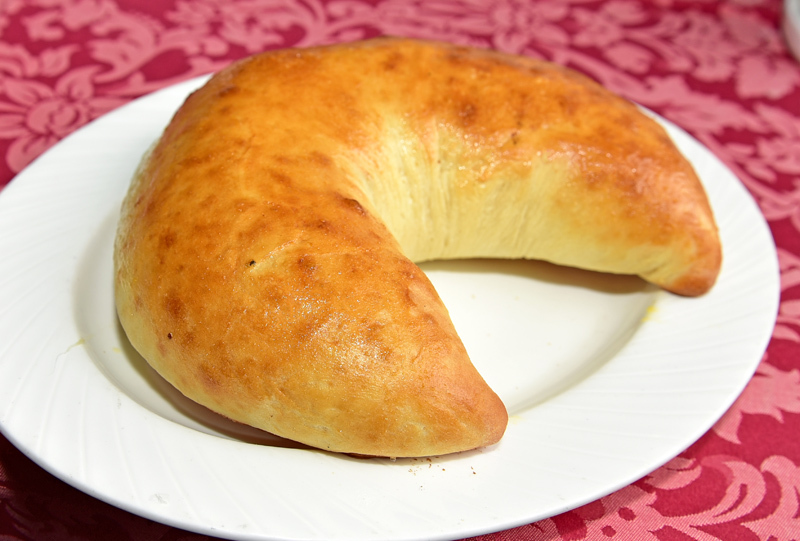 Like many of its cousins, the Gurian khachapuri is named after a region in Georgia, Guria, which borders the Black Sea. With a population of less than 150,000, Guria is definitely on the smaller side. Its regional capital, Ozurgeti, barely clocks in at 20,000 people. Touristic attractions are minimal — check out pictures of the dramatic theater, the history museum, and the Gureli Palace online, and you can probably skip the visit. Still, Guria can claim one famous citizen, Eduard Shevardnadze. Guria is sandwiched between Mingrelia, Imereti, and Adjara. In other words, with such neighbors, it has the best possible khachapuri credentials. And yet, truth be told, it’s not a totally legit khachapuri. Locals call it guruli gvezeli, Gurian pie, and traditionally eat it only once a year for Christmas. 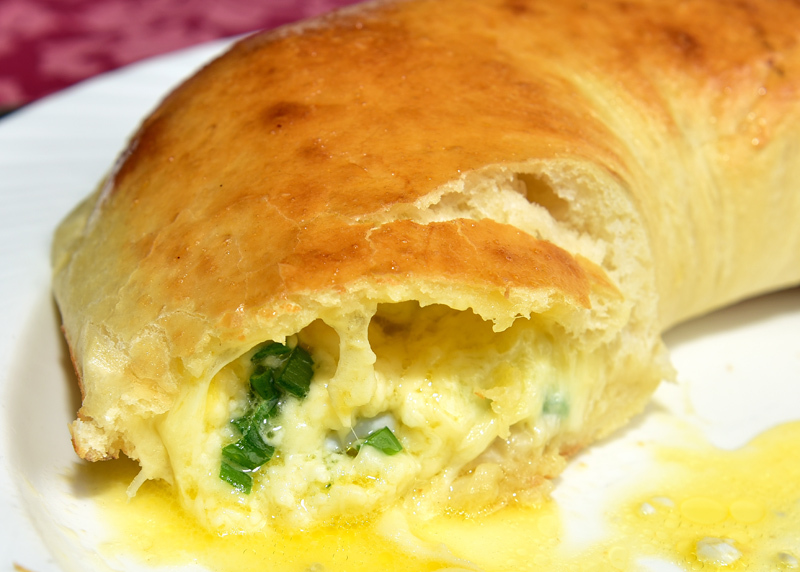 The recipe is simple: yeast dough, cheese mixture, and hard-boiled eggs. Restaurant Tiflis also adds scallions, which makes it a bit more interesting. 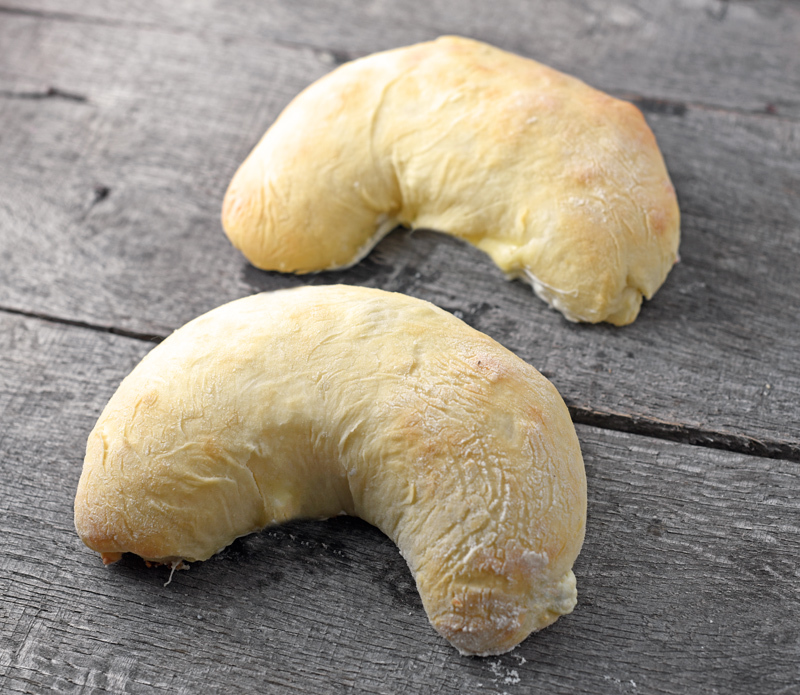 The dough is then folded a little bit like a calzone, but in more of a crescent shape, and baked in the oven. The pie can be small and served as an individual portion, or large and feed a whole family. According to Tinatin Mjavanadze’s Georgia with Taste, tradition dictates that for Christmas, a coin is baked into one of the individual pies, and the person who finds it is promised happiness for the whole coming year. The lucky winner must then protect the coin like a talisman, and put it on the dinner table on New Year’s Eve. To me this sounds more like a way to start fisticuffs at the table even before the new year begins, but hey, I don’t live in Guria. But we don’t need to live there or wait until Christmas to eat a Gurian pie. My recipe reuses the yeast dough and cheese mixture from my Mingrelian khachapuri post, with the extra hard-boiled eggs and scallion preparation. Even though you’ll want to bake the bread to order, it doesn’t take a terribly long time to make. And by calling it a khachapuri and getting rid of the disputatious coin, I hereby proclaim that we can all stuff our faces with it any day we like, and be happy! In a cup, mix the yeast, milk, and sugar, and let rest for 5 minutes. In the bowl of an electric mixer fit with the paddle attachment, add the yeast mixture, yogurt, egg, and 2/3 of the flour, and mix on medium speed until homogeneous. Add the rest of the flour, melted butter, and salt, then mix again for 1 minute. Cover with plastic wrap, and let rest in a warm place until doubled in volume, or about 1 1/2 hours. I usually keep the bowl on the stovetop, with the oven on low heat. If you have time, punch down the dough, cover, and let rise to the same level again (the second rising is usually a bit faster). In a saucepan over medium heat, sauté the scallion whites in the butter and cream, until soft. Stir in the the scallion greens, remove from heat, and let cool. Slice the mozzarella, and let rest on paper towels for 10 minutes to drain out some of the moisture. In a bowl, crumble the mozzarella and Bulgarian feta between your fingers. Mix in the scallion mixture, and season with salt so that the filling is quite salty but not inedible. Reserve. On a floured surface, roll the dough to a 20 cm diameter disc, and transfer to a floured pizza peel. If you don’t have a pizza peel and stone, a baking sheet will do. On one half of the dough, crumble half of the cheese-scallion mixture, then line up the quartered eggs on top, season with black pepper, and top with the rest of the cheese-scallion mixture. Fold the dough in half to cover the mixture, seal shut with your fingers, then fold the sealed edge over the top of the bread. At this point the khachapuri should be shaped more or less like a log; you can press on the sides to make it a bit less flat. 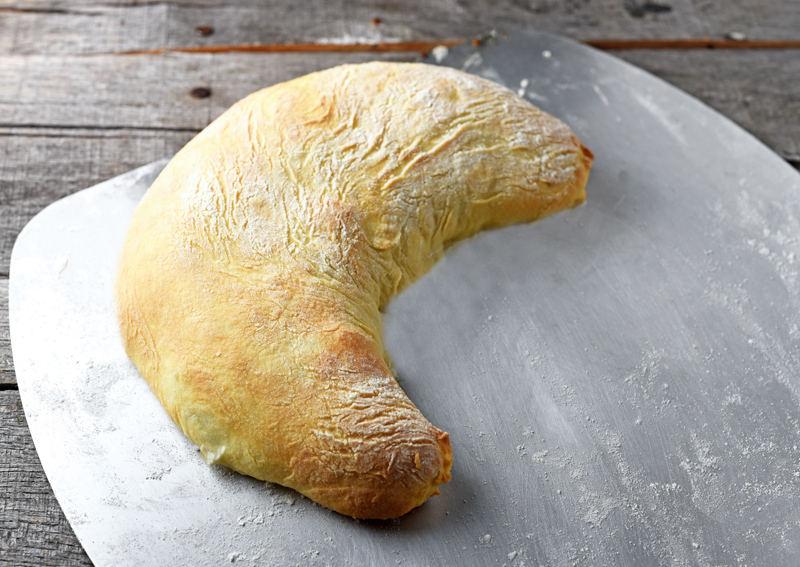 Flip the bread, and curve it into a crescent shape. 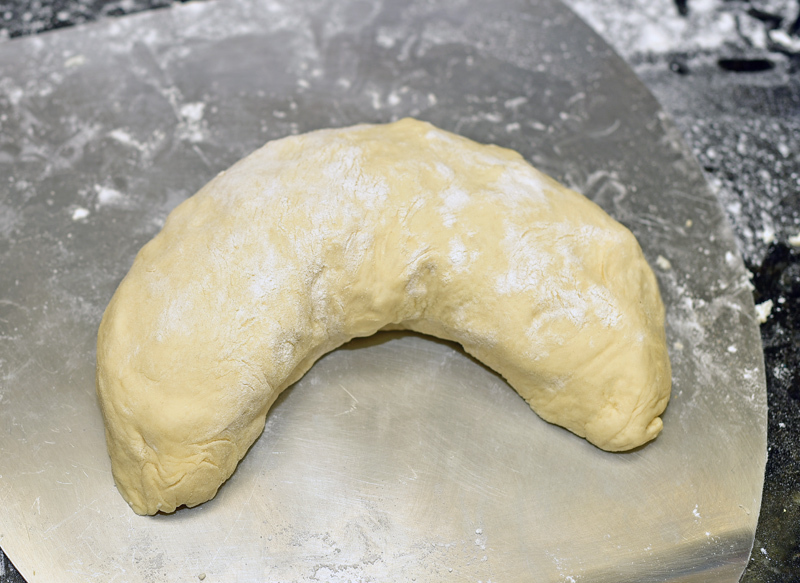 Pinch off some of the dough at each end, and discard (the reason is that the ends tend to lack cheese mixture). Place a dish filled with water on the bottom rack of an oven heated to 225 C / 450 F, and a pizza stone on the middle rack. Transfer the khachapuri to the pizza stone and bake for about 17 minutes, until light golden brown. Let rest for 5 minutes, slice and serve. 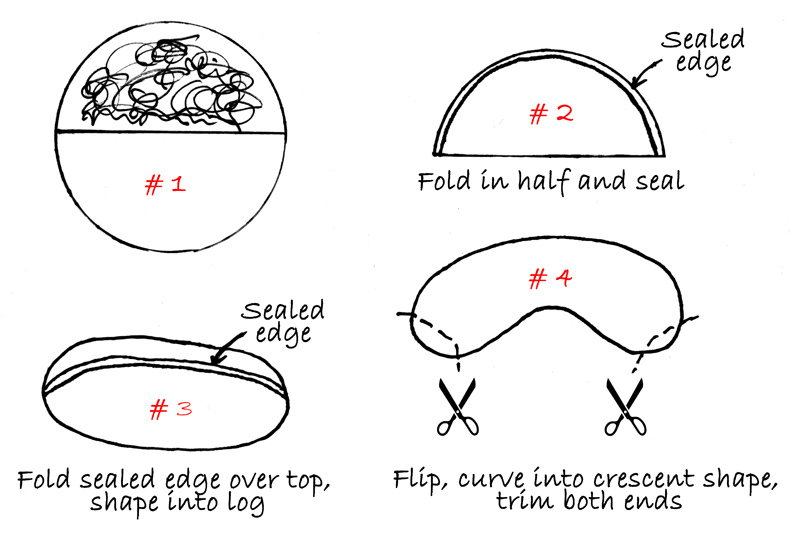 Follow the same method as above, but roll the dough to a smaller 14 cm diameter disc. If you decide to bake a coin/charm inside, tell your guests to bite carefully! The baking time is also slightly shorter, 12-15 minutes.